This is a guest post by Scott Fleming, an Archive Scientist at Space Telescope Science Institute (STScI). This is the third in a series of posts about MAST, the Mikulski Archive for Space Telescopes. 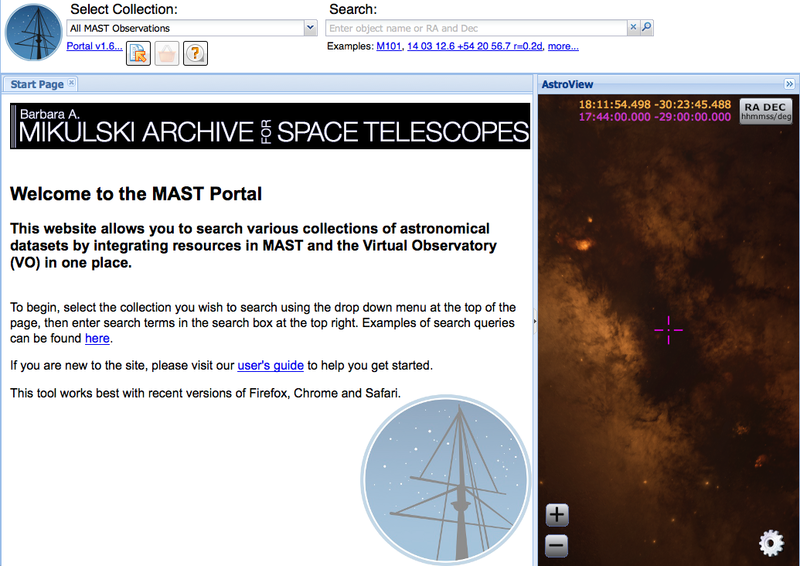 The Mikulski Archive for Space Telescopes (MAST) is pleased to announce that the first release of our Discovery Portal is now available. The Discovery Portal is a one-stop web interface to access data from all of MAST’s supported missions, including HST, Kepler, GALEX, FUSE, IUE, EUVE, Swift, and XMM. 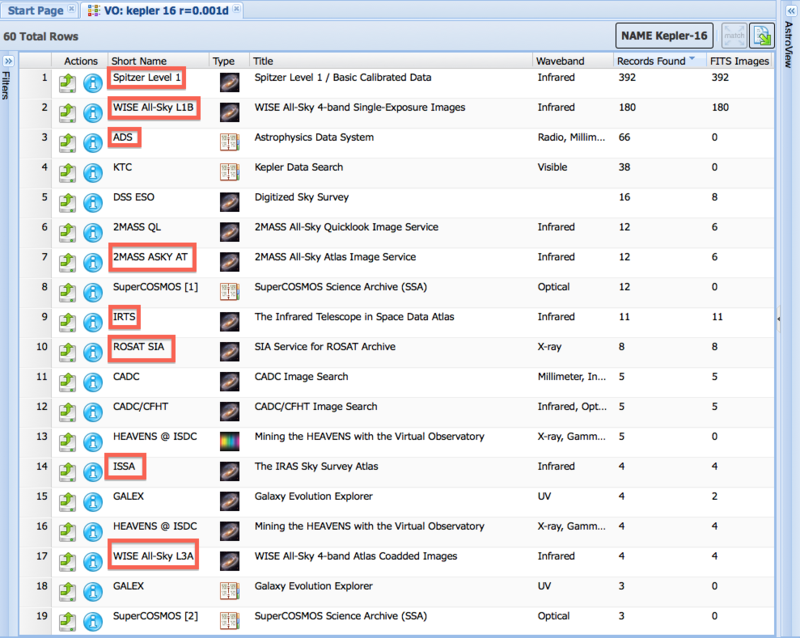 Currently, users can search using resolvable target names or coordinates (RA and DEC). The returned data include preview plots of the data (images, spectra, or lightcurves), sortable columns, and advanced filtering options. 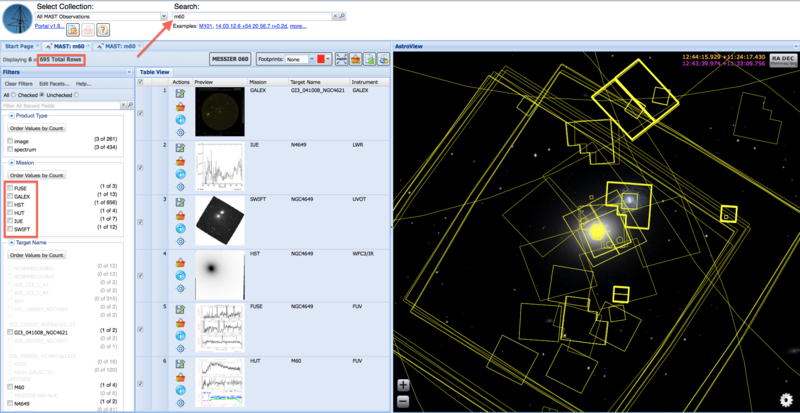 An accompanying AstroViewer projects celestial sky backgrounds from DSS, GALEX, or SDSS on which to overlay footprints from your search results. A details panel allows you to see header information without downloading the file, visit external sites like interactive displays or MAST preview pages, and cross-search with the Virtual Observatory (VO). In addition to searching MAST, users can also search the VO based on resolvable target names or coordinates, and download data from the VO directly through the Portal (Spitzer, 2MASS, WISE, ROSAT, Chandra, NASA ADS, NED, etc.) You can quickly download data one row at a time, or add items to your Download Cart as you browse and download when finished, much like shopping online. Basic plotting tools allow you to visualize metadata from your search results. Users can also upload their own tables of targets (IDs and coordinates) for use within the Portal. Cross-matching can be done with all MAST data or any data available through the CDS at Strasbourg. All of these features interact with each other: you can use the charts to drag and select data points on a plot whose footprints are highlighted in the AstroViewer and whose returned rows are brought to the top of your search results grid for further download or exploration. MAST is home to more than 15 missions, and many of these have had their own separate search interfaces from which to access their data. No longer! The MAST Discovery Portal allows users to locate all data MAST has on a particular target or in a particular field with a single search. Not only does this simplify searching for known data, it allows for discovery of data on your targets you may not have been aware of, subsequently enabling new research capabilities. In the example below, a quick search on “M60” results in data from six different missions, ranging from the 1980’s to the present day, including both images and spectra, all of which are available for previewing or downloading. Find all of MAST’s data for your targets in one place. In addition to data at MAST, users can search for data available through the Virtual Observatory, either by providing a resolvable target name or coordinate, or by using the “Search The VO” button in the More Information windows for a given MAST data product. The VO gives Portal users access to data spanning the electromagnetic spectrum, from radio to high energy, including images, spectra, catalogs, and even NASA ADS records. You can browse contents and download the data from within the Portal without having to leave to visit other sites. In the example below, a quick search of the circumbinary exoplanet host star “Kepler 16” reveals dozens of additional data sources available, including NASA ADS records, X-ray data from ROSAT, and IR images from Spitzer, WISE, 2MASS, IRTS, and IRAS. All of these data can be downloaded directly through the Portal using the given VO service listed in the search results here. Discover new data that you weren’t aware of for your targets. Users can upload tables of targets to search for, if RA and DEC are provided. Furthermore, these tables, once uploaded into the Portal, can be used to interact with other features of the Portal. If a VO Table is uploaded specifying the data type of columns, the Portal’s filters, charts, and other tools can be used with your uploaded tables. The rows displayed in any tab can be exported back out of the Portal, in a variety of file formats, to use on disk in your own scripts. 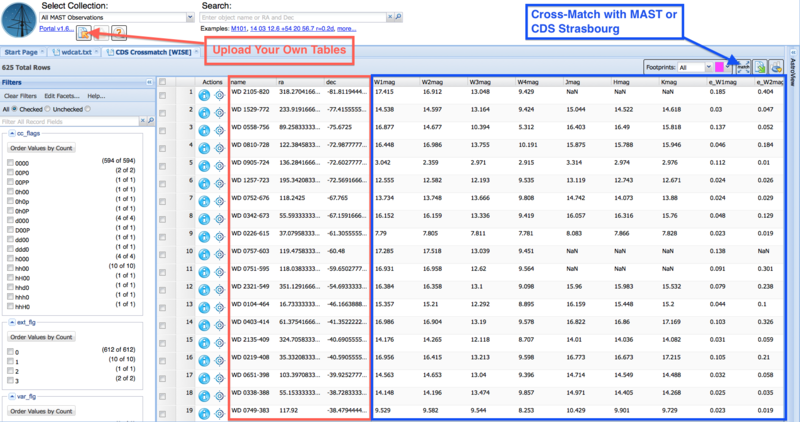 The Portal’s cross-match feature allows you to cross-match any table in the Portal against either MAST data or any data products available through the CDS at Strasbourg. In the example below, the entire McCook-Sion White Dwarf Catalog was uploaded into the Portal, then, using the Cross-Match button, was spatially cross-matched with the WISE catalog. The new table now includes 4-band WISE fluxes; J, H, and K fluxes; associated flux uncertainties; and other data from the WISE catalog for our white dwarfs that had matches. The entire process took a matter of seconds. Cross-match targets with MAST or data at CDS Strasbourg, export the resulting table, and start working on your science script right away. Learn more about the MAST Discovery Portal by watching our introductory videos (short, 2-minute videos explaining the basics of how to use the Portal) or by visiting the Portal’s help page. Note that the tutorial videos currently do not have voiceover. Be sure to keep your eye open for more improvements in the future, as we continue to add new functionality and data into the Portal. One of the best ways is to like us on Facebook or follow us on Twitter. Finally, if you have questions or comments, please send them to MAST.